I don't know about your kids, but my kids are constantly in motion and we LOVE movment activities. I love it and I love their energy, but if we are stuck indoors for any reason it starts to drive me a little bit crazy too. You could even make this an outdoor game too. This week I came up with a simple Counting Movement Stick Game based on several movement stick ideas I've seen teachers use before in their classrooms. I am super excited to use this activity all of the time now when my kids need to get some energy out or when we want to practice counting. This activity is also so easy to adapt for older or younger kids! Scroll down to see how. Brainstorm with your kids and come up with any and all movements that they can do. Here are a few examples: hop on one foot, jump, skip, clap, grapevine, bum kicks, high knees, doggie kicks, leg kicks, arm circles, etc. 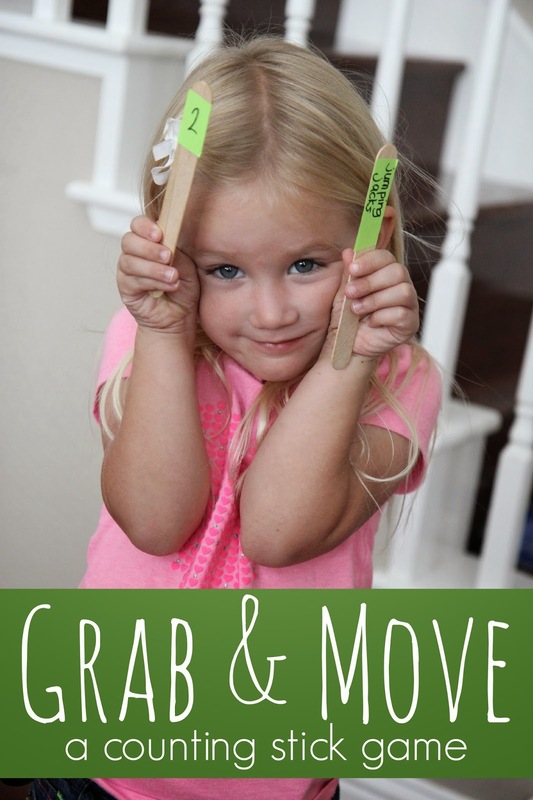 Next you'll want to write each movement on a craft stick. I like to make the craft sticks look cuter by adding paper tape or washi tape and then writing the movements on top of that. You'll also want to write numbers 0-20 on sticks (or for older kids you could write simple addition or subtraction facts). Finally you'll want to put each set of sticks in a cup (or jar) and set them in a spot where you can access them and use them often! Grab two sticks and read the movement activity and number. Then you can either have the child who pulled the sticks do the movement activity or have everyone do the movement activity on the stick. If your child pulls the number 5 and doggie kicks then everyone (or just the child) would need to do 5 doggie kicks. Then it becomes the next person's turn to pick a stick! I also decided to create a Fall themed version of our movement stick game since my kids are super excited about Fall activities right now. The movement activities I came up with included things like jumping in leaves and picking apples. For younger kids you can just skip the counting part of this activity (or just stick to numbers 1-5) and just do the movements. For older kids write down a number sentence instead of just a number on the sticks. Have the child solve the number sentence in order to know how many movements they need to do. Have you tried movement games like this with your kids before? I loved how this activity easily incorporated number recognition and counting and was active and fun too! Also, don't forget to check out our weekly Move & Learn Series. This is such a great idea! I have a two year old and I'm always looking for new things to do with her AND I can use this same concept to change up my own workout!